The final numbers are in, and the late icon's collection continues to set world auction records. 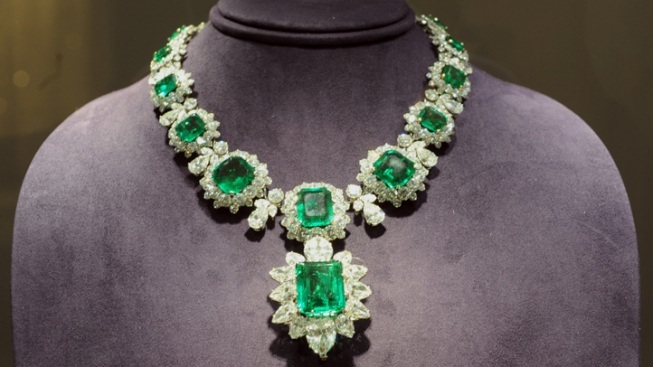 An emerald-and-diamond necklace from the estate of Elizabeth Taylor was among several items up for auction at Christie's in New York. The late actress's collection sold for a record-setting $115 million. The final numbers are in, and Elizabeth Taylor's impressive collection of jewels, gowns and memorabilia has gone for a jaw-dropping $157 million after several days of auctions. Even more unbelievable is that her gems alone accounted for a staggering $137 million of that total. The late actress's jewelry collection set a world auction record by selling $115 million during its first day at Christie's. Some of the winning bids were up to 50 times higher than the auction house had estimated. The number included $11.8 million for a pearl necklace and more than $8 million for a 33.19-carat diamond ring that happened to be a present from Richard Burton. The early estimates for the pearl necklace were only around $2-$3 million. The previous auction record for pearls was just over $7 million, set by a necklace called The Baroda in 2007. The rest of the collection included earrings, pendants, and other gems from famous jewelers such as Cartier, Van Cleef & Arpels, and Chopard. The auction was held in Christie's auction house in New York. The least expensive item? An Emilio Pucci two-piece outfit that went for a relatively mild $563. A diamond bracelet given to Taylor by close friend Michael Jackson sold for $194,000. Christie's will be hosting another auction later this week that will include Taylor's art collection, her clothing, and some memorabilia. Part of the proceeds from these auctions go to The Elizabeth Taylor AIDS Foundation. Taylor died in Los Angeles this past March at the age of 79.